The other team said I could take a practice slide. Hmm, to show off my imbalance and lack of skill? No thanks. I think I’ll throw that 30 pound rock when I HAVE to, not anytime before. Will I remember how to do this? It’s been ten years. And it wasn’t like I was headed toward stardom when I was playing a mixed league with my hubby; it was social time for me. So where did you say your daughter got her hair cut? I asked the second. My question wasn’t eagerly responded to as the rock was hurdling toward us, the last rock of the end. I didn’t even understand why my teammate wouldn’t give me an answer. Turns out she was paying attention to the game! 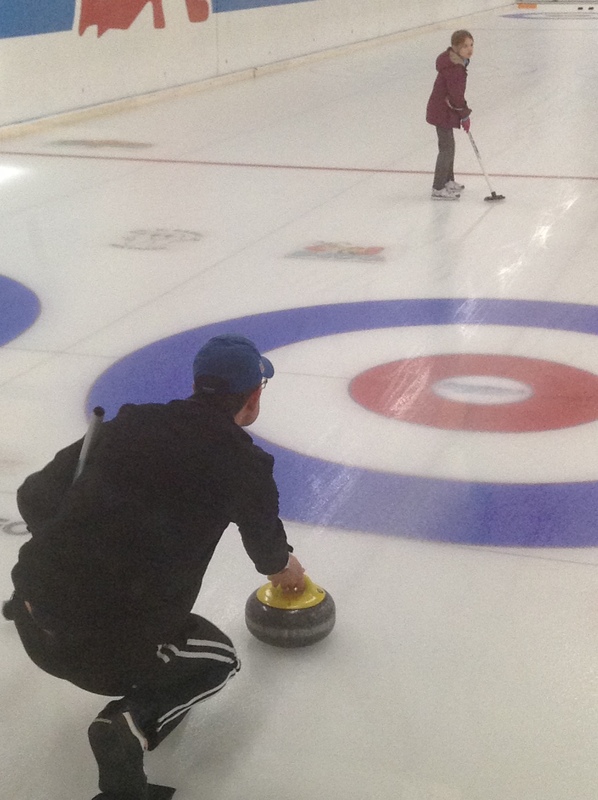 So, clearly, I wasn’t going to be much help at this family bonspiel. 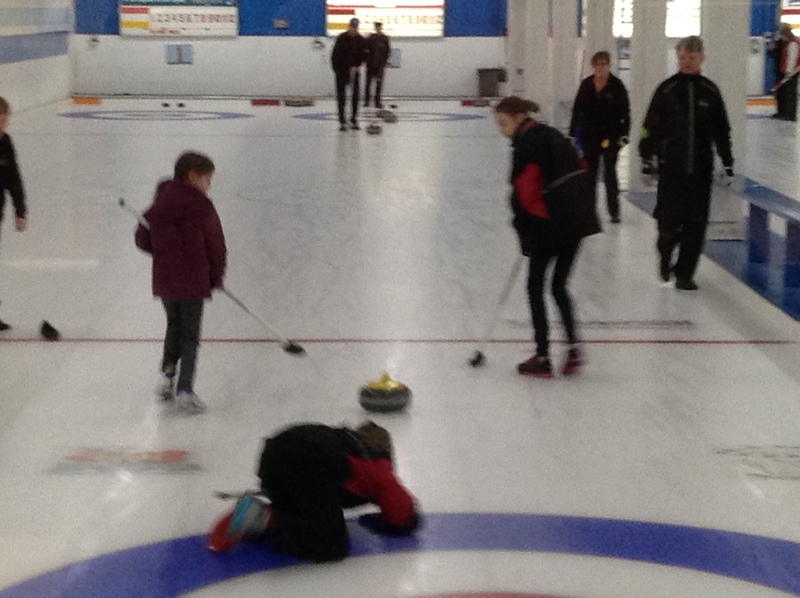 My husband convinced us that since it was a family bonspiel, there would be other kids with their parents. Turns out our three girls were the youngest kiddos on the ice. 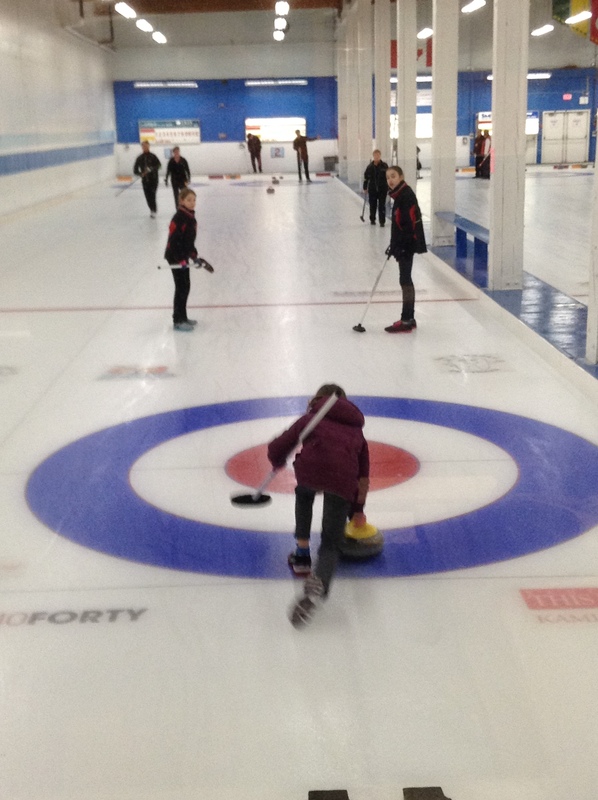 They had been learning curling for the last few years on Saturday mornings though, and their confidence and theoretical knowledge was healthy. Jim warned us that we would likely not win a game, but we would get some practice. And we would have a lot of fun. 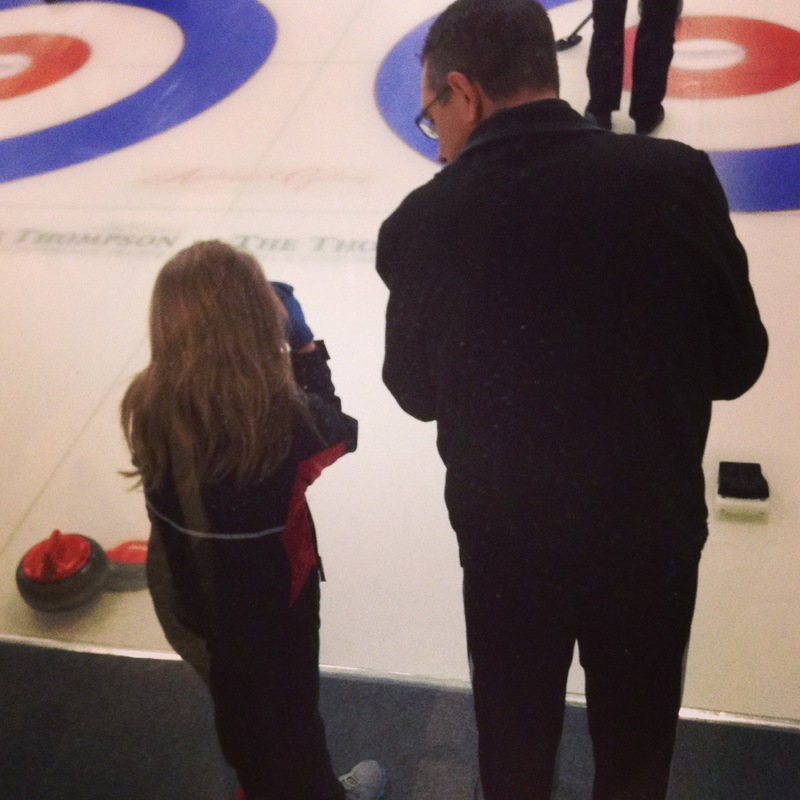 Our eight year old had a history of wanting to skip curling mornings–and I don’t mean BE the skip, I mean, AVOID the curling mornings–so her attempt at getting that rock to the other end of the sheet was commendable, as that rock was half her weight. However, after a couple ends, I substituted as the lead. Our twelve year old gave it her all, taking out rocks at the other end, attempting inturns and eagerly sweeping beside me (this I could do, and have plenty of daily practice actually). And our eleven year old, she had the confidence, hearty intention and verve to throw that rock like an up and coming athlete. She was on a roll. 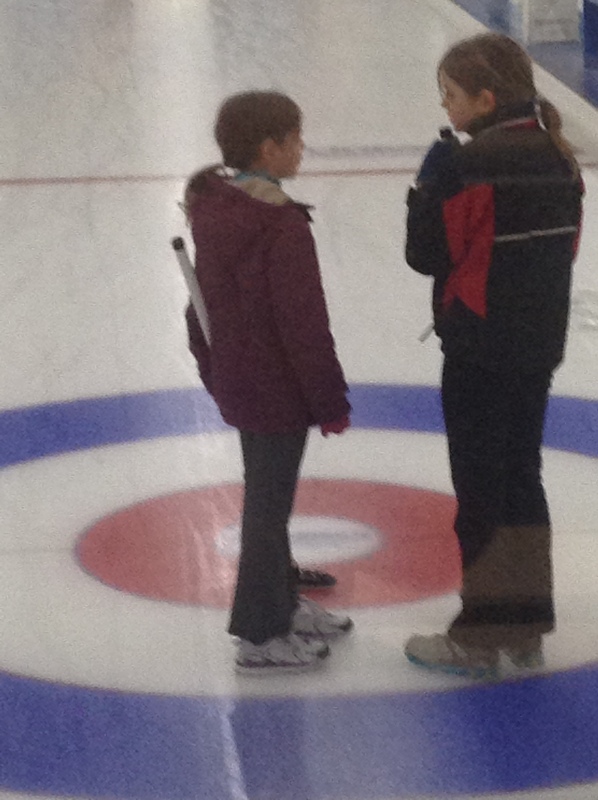 And a little thrilled to be compared to Scottie’s 2013 champion Rachel Homan by neighbouring curlers. I was the ‘lead’ cheerleader. When I wasn’t on the ice to keep the cheerfulness aloft, and with my husband at the other end of the ice, the happy energy would quickly decline, and snippy comments of disapproval, or overly ‘helpful’ attempts, were just too much for the three to maintain a useful energy for the game. So I won’t discount my impact. My hubby was on his own as skip, and as final rock. Ten years ago, I couldn’t have put my self-consciousness out of mind to pick up a broom and attempt to kickoff and throw that rock to the other end of the sheet–especially since I am just not the athletic type. So I had to LEARN to play as I played. This all occurring despite an eager audience–still, I was willful in participating in this on-ice strategy game because my hubby loves it. 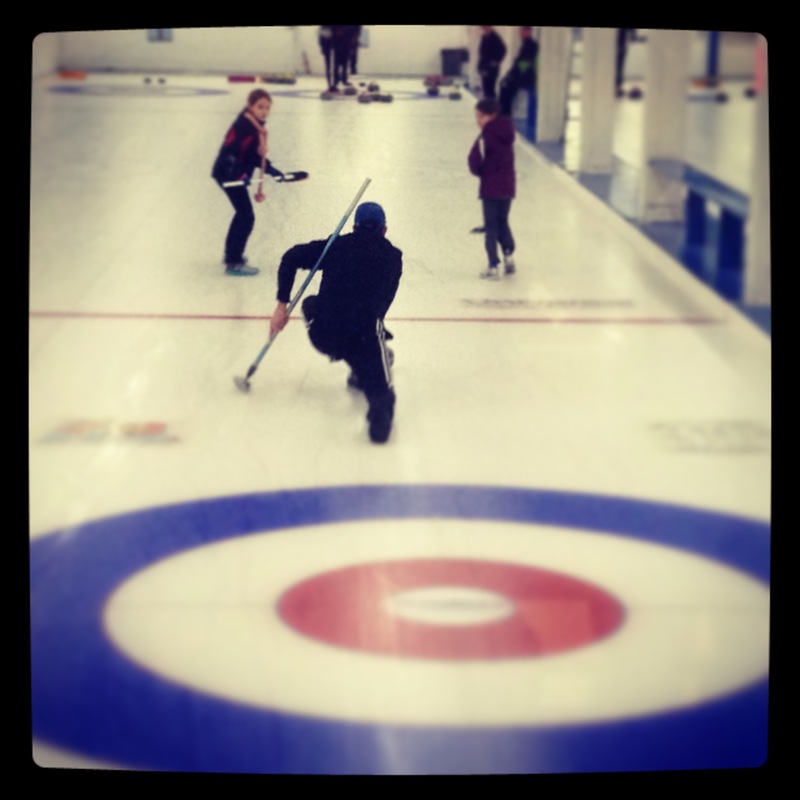 Quickly my girls recognized my lack of curling theory, and prompted me in which direction to throw it. Or whether or not I was actually getting it past the hog line, or even anywhere near the house. They’d direct me in how to push myself out of the hack, how to hold the broom and what dad was pointing at down at the other end. I had a bunch of lessons that day. Waiting for our skip to meet us at the end, I told my eldest daughter: My favourite part of this weekend is not knowing as much as you guys. Eyes bugging out of her head, Really? Yup, it’s kinda nice not having to be the ringleader, the expert or the educational director. You girls have a lot of knowledge to share and I am most glad to be learning from you. Oh, I had plenty to teach. That you should remain stoic when you’re winning a game. The all-adult teams that we’re playing know that gloating isn’t considerate. And that games turn quickly, and what will you do when you lose the game you were gloating about minutes earlier? They learned to recognize their sister’s sensitivities…that one doesn’t need any criticism…she already knows when she hasn’t thrown well. She just needs kind smiles and encouragement. And sometimes a kick in the pants to stop sulking because of an imperfect throw. Or, no, you didn’t win, but you don’t realize who you’re playing! It’s hilarious that you’re beating yourself up over the loss against THAT team. That team’s skip won silver in the Brier before your mother was born; he won the senior men’s provincials LAST year. And the lead and third were provincial winners in senior women’s too. You, my friend, could not win that game. But it was a pleasure to play them, wasn’t it? And we all learned what it is to win together. Playing a seasoned team for our first event, we won! I threw a few phantom lead rocks. My hubby was on his A-game, curling some tricky rocks into the button. My oldest daughters threw their Valentine hearts out and each banged home double rocks, with a prize awaiting them at the end of the weekend. And I won, because I could see the benefit of being my children’s student. I might not intentionally bruise my knees and become Advil-dependent for an awfully long time again, but I will get to my morning piano practice. I decided it was time to take piano lessons, from my daughter. Madelyn, I’m coming! “While we try to teach our children all about life, our children teach us what life is all about”. 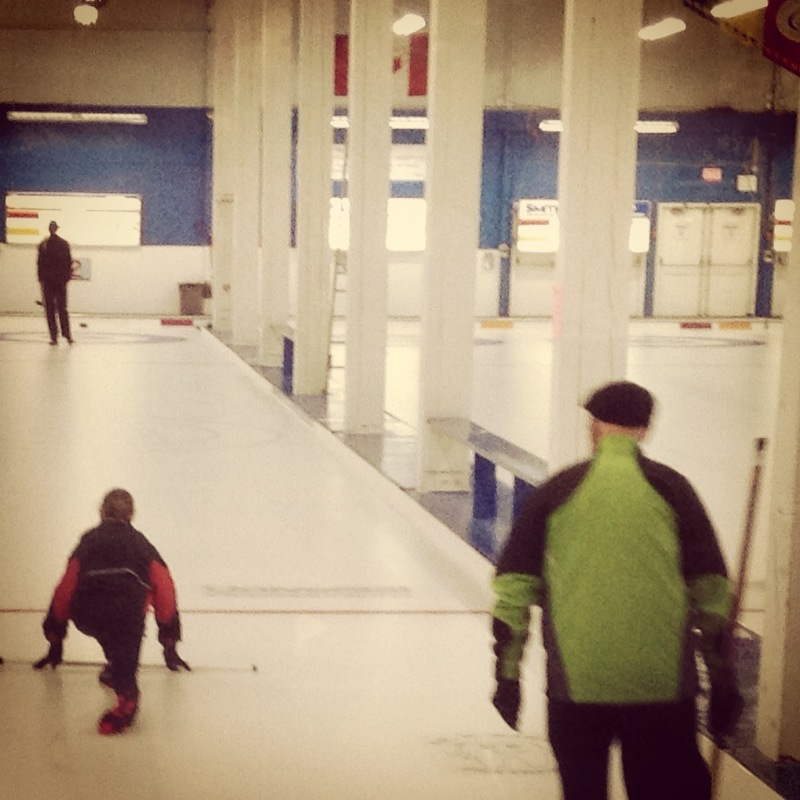 Tags: curling and homeschooling, curling and kids. Bookmark the permalink. So true, Jacob is my go to Mr. Tech/ fix it guy when Sean is not home and when I first asked him for help he asked if I was joking! LOL Nope, I know you know a lot more about this than I do. It is so refreshing to sit back and let our kids teach us skills they have learned! I don’t think I could sit and take the time my girls have to learn how to make such fancy knotted friendship bracelets out of embroidery thread. Amazing skills our kids have time to learn!